”Please hurry, the wedding has started!” I cried to the taxi driver. I couldn’t believe we have traveled all the way from Canada, and now we were late for the wedding. We started with our taxi 18 kms and 3 hours ago, and were still looking for our hotel. We needn’t have worried. 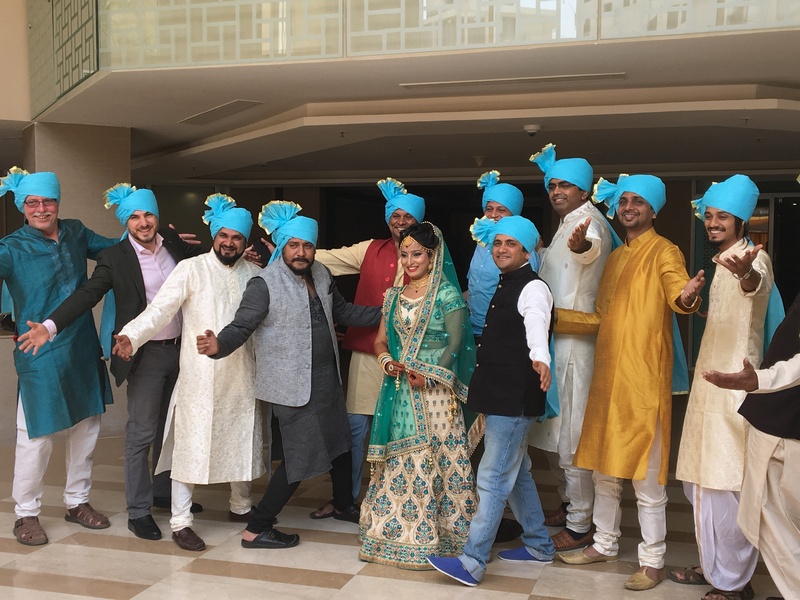 We were welcomed like family from the moment we arrived at the V Club in Gurugram just outside of Delhi, the venue for Gunjan and Farhan’s wedding, ushered immediately to the 4th floor and into the bride’s families’ loving embrace. Everyone seemed as thrilled to have us as we were to be here. 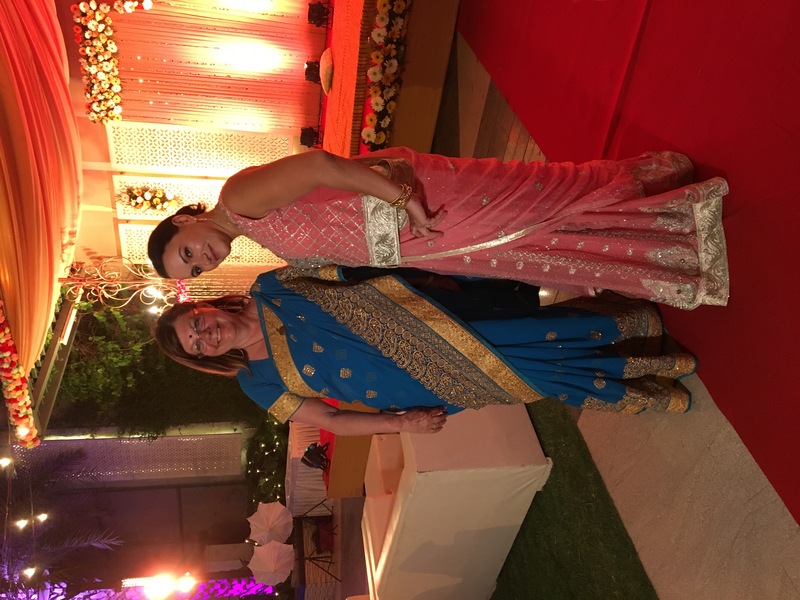 Gunjan had a schedule of events, but nothing happened even close to on time. At 3 the Haldi ceremony was to start and at 4 the Mehendi. Everything was many hours late. I expected a huge wedding. I’d heard 1000 guests is not uncommon at Indian weddings. I expected Ray and I would be observers, more like a show for us than an inclusion. We were very wrong. Guests came and went throughout the entire two-day celebration, but I’m sure there were never more than 100 people there, probably more like 70 guests. We were an intimate part of everything. We sat with Gunjan and Farhan’s friends from Dubai most of the time, a United Nations of culture and conversation. 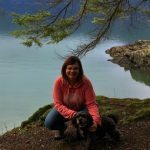 Everyone spoke English, partly for us and partly because it is the language they all have in common with each other as well. There seems a fierce pride in Dubai. To bea citizen of the United Arab Emirates one must be born there. There were two national Emirates at our table, and many who could only wish I think. I believe we were the only Westerners. While we waited for things to begin, there were men painting henna. I had my hands done but some younger girls and men too, got more elaborate hennas. It takes about an hour for it to dry so once painted you are doing nothing but visiting and holding your hands out for a while. 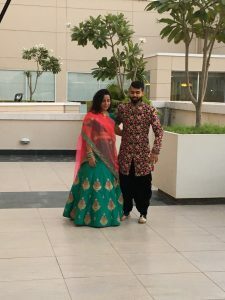 Gunjan and Farhan finally arrived, much more casual than I would have expected, dressed in traditional yellow for the haldi, and now I know why. 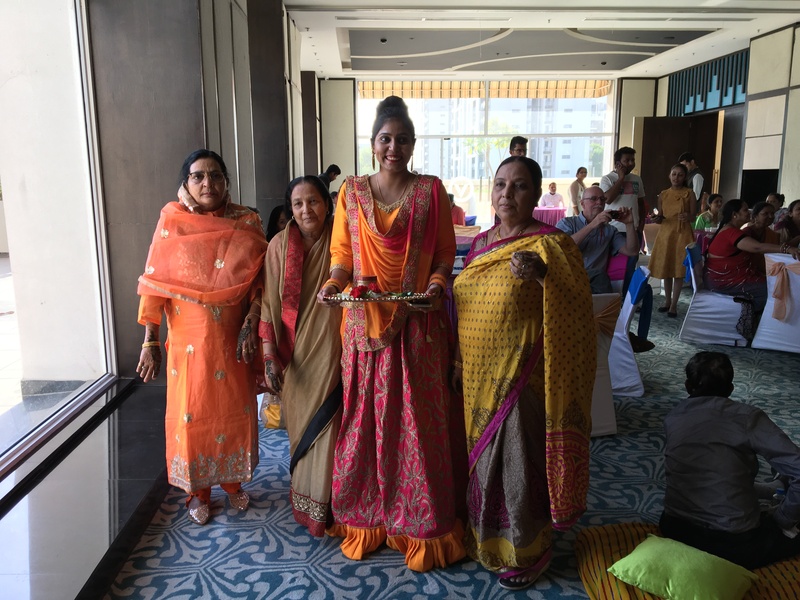 Haldi is the turmeric ceremony. The guests take turns smearing a bit of turmeric paste on the bride and groom. At times there was more than a little, and the feet were also smeared. Every guest took their turn so by the end Gunjan and Farhan were awfully messy. Gunjan and Farhan arrive arrived for the Mehendi ceremony a tad more formal. Farhan looked positively dasher in a colourful, bejeweled jacket. Gunjan’s dress was beautiful. 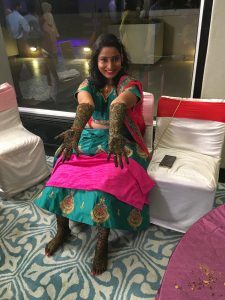 Gunjan arrived well before her groom, visiting and arranging whatever needed arranging before settling in for the Mehendi. Mehendi is the henna ceremony. Gunjan patiently sat while both arms and legs were painted, the most intricate of everyone’s, and then had to watch it dry for the next couple of hours. We all just sat and visited, with each other, with Gunjan. At some point food came out, delicious food, but Gunjan got only the few bites her sister fed her. Sangeet followed, and wow is all I can say. Sangeet is the music ceremony. 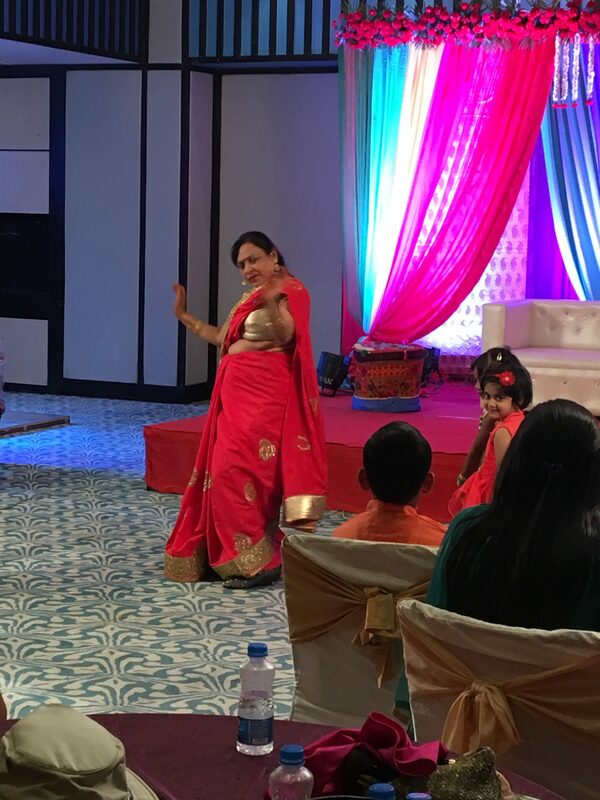 Many guests performed, singing and dancing traditional and not so traditional music and dance. The Bollywood influence was evident in many of the choreographed dances. By the end of Sangeet Ray and I were up on the dance floor doing our best Indian dance routines. Turns out Canadians actually already do dance a bit like Indians. It was SO much fun. Sarah is staying with us at the same hotel, and it’s extremely hard to find. The three of us shared a cab and walked around the closed shopping mall, through muddy construction to get home for the night. Sarah doesn’t think two outfits were enough for me, so she offered to lend me her extra in the morning. We flopped into bed exhausted. I couldn’t imagine how tired Gunjan and Farhan were. I expected the bride would be beautiful and have several dresses, and she was. I was unprepared for the glamour of all the other guests. Indian women are so beautiful! On the first day of the wedding we were introduced to so many people, and each name was as exotic as the last. We both tried to keep track of people by what they were wearing. That was a mistake, because everyone kept coming in with different and even more beautiful dresses for every ceremony. 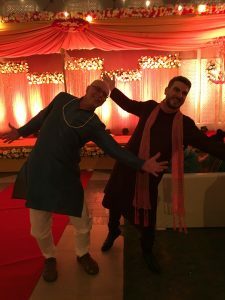 I’m ashamed to say that Ray and I prepared our clothes by walking into the tailor at the craft market in Delhi and accepting what he recommended. I wish I could do it over again. 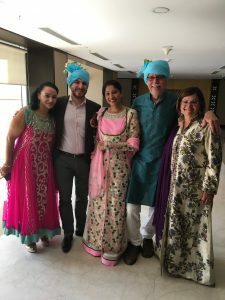 I did have a beautiful sari, and Ray looked amazing in his Indian outfit, but we really were shadowed by some of the other guests attire. 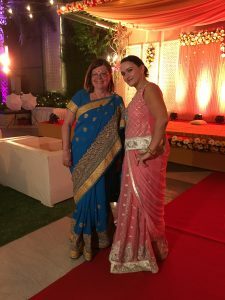 Special thanks to Nisha for dressing me for the reception – YouTube just wasn’t cutting it. The day’s start was scheduled for 11 AM. We knew it would be late but we were helpless to arrive late because what if it wasn’t? It really doesn’t matter anyway. We are meeting the most interesting group of people, and I could just sit and visit all day with them. Sarah has loaned my a beautiful, but very warm looking, Indian dress with matching tights and scarf, because only two outfits was shamefully inadequate. It actually had the effect of protecting me from the heat. The whole day today took place outside. Ray, and all the other men were herded up to the third floor where they were adorned with a blue decorative turban. There was no escaping it. All of the now appropriately turbaned men ushered Gunjan in, then headed out to the street, where a horse and drummers had arrived. 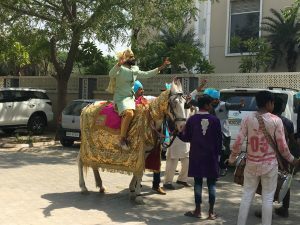 Farhan mounted the horse and the men danced to the drumbeat. There was negotiation to pay the horseman so he would let Farhan ride off. There was negotiation that threatened to turn into blows. I had no idea if it was for show or for real, but eventually the correct price was arranged, and Farhan arrived in splendour. 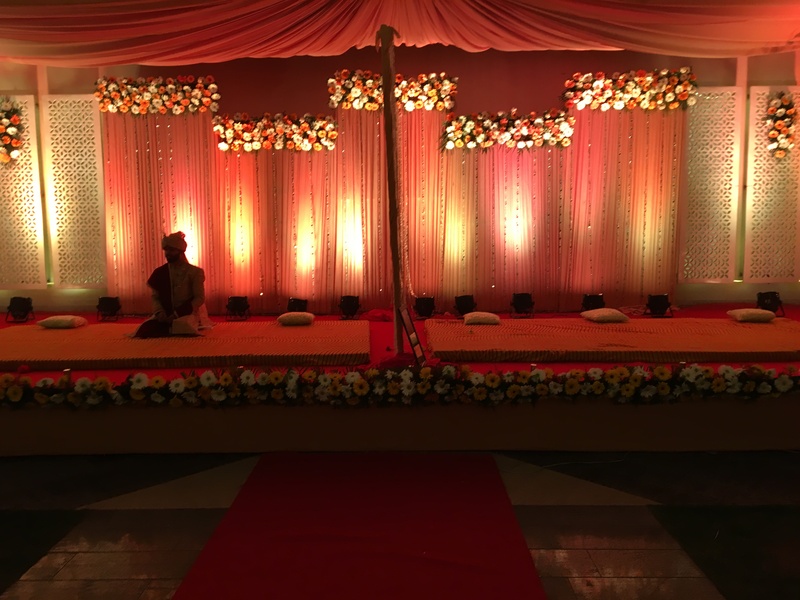 The Hindu wedding was anything but a solemn affair. People wandered in and out, visiting with each other under the tent set up for the occasion, while Farhan negotiated with the brides family. Gunjan was absent. How much will they pay him to take Gunjan? They sat around a small fire while the gifts accumulated. At times they used a ledger, at other times cell phone calculators. I sat beside Harrish, a good friend of Gunjan and thankfully he explained everything that was going on. Farhan was a hard bargainer and the negotiations went on for hours. after Allan these preparation, I wondered what the outcome would be if a price could not be found, but finally it was settled. 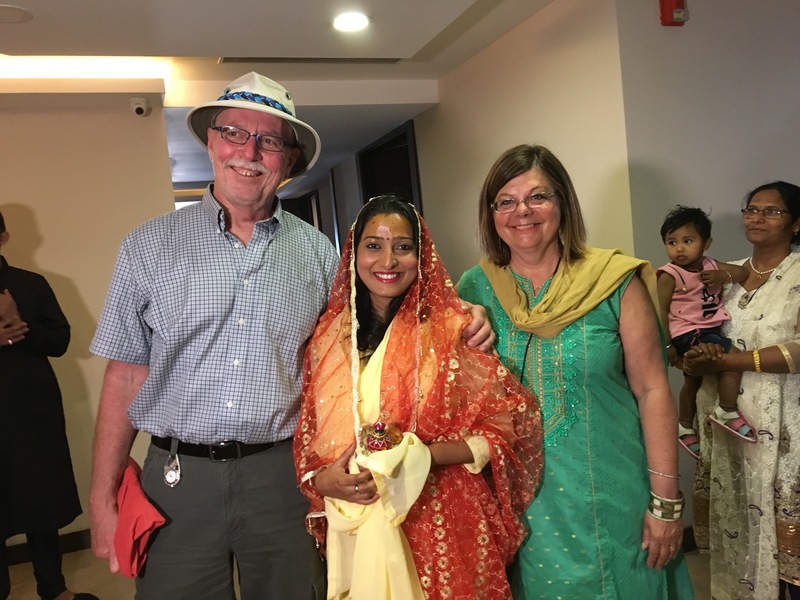 Gunjan was escorted in, much more formal now in her next bridal outfit. 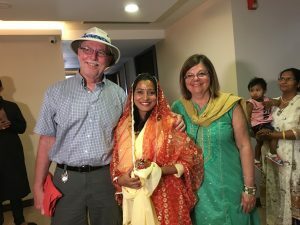 They walked 7 times in a circle around the fire, and then they were wed as Hindus. I may have missed something because a great lunch was served during the ceremony, and we all left for a while to eat. Now the staff started to play their real magic. The V Club’s courtyard was transformed into a beautiful reception room. Lights were strung overhead, a stage for the Muslim ceremony was ornately adorned. Food preparation began. A big cook fire was started and threatened to burn down everything, but someone put it out before it ruined everything. Table after banquet table was set with silver serving trays, cards labelling what will be in them. I don’t recognize a thing. This was the third time this wedding fed us all, and was the grandest meal of all. 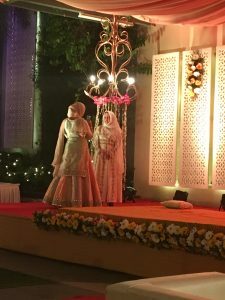 While the reception was prepared, the guests retired to don their most glamorous outfits. 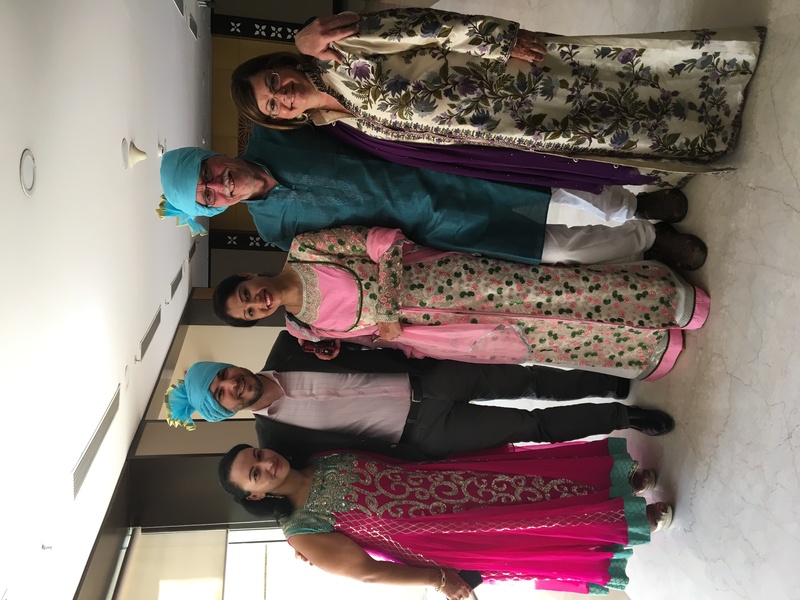 I found Nisha and wrapped up my sari, and Ray retired his blue turban for a pink one. When the guests reemerged it was down the red carpet, with photographers and drones ready to make sure there was a photo of every moment. The photographers were eager throughout the entire two days, but tonight they went all out. 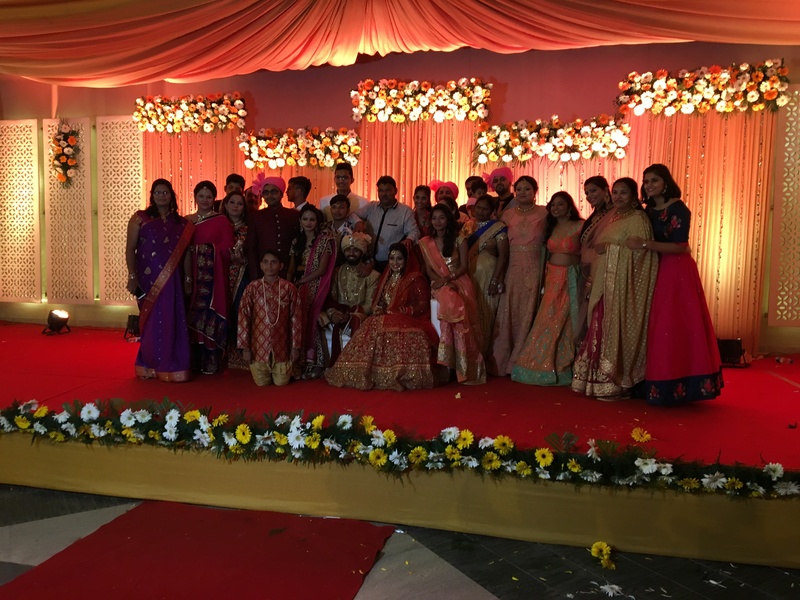 Finally Farhan arrived with his male family members surrounding him, and then Gunjan, surrounded by women. 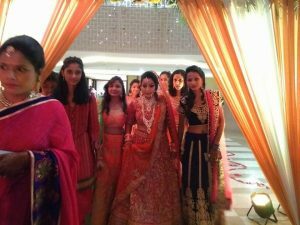 Gunjan was wearing the most ornate wedding gown I’ve ever seen, a red gemmed gown that I had felt the weight of the day before. She was walking slowly, for the heft of the dress or solemnity of the occasion, or maybe a bit of both. 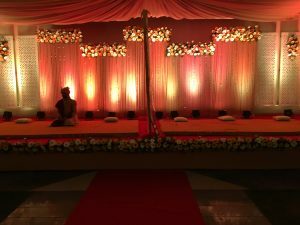 Bride and groom were seated on the stage, separated by a decorative string wall. Traditionally, this party would be completely separate, the men with the men and the women with the women – and they would not join together, but tonight is not completely traditional. 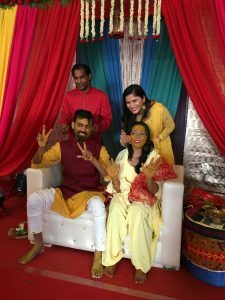 Farhan did his thing, and Gunjan hers – I didn’t understand it. The speaker then switched to English, instructing the couple on their lives forward. When it was over, the couple were married in every way possible. The last ritual was Farhan seeing Gunjan, like it was for the first time, in a mirror. The reception followed, food for the Gods. I couldn’t try everything, there was just too much. There was even meat for the first time at this meal. What an experience! I feel so honoured to have shared this special moment in the lives of Gunjan and Farhan. They are destined to have a wonderful, and adventurous life together. The greatest gift they could ever have given us was this invitation, and the opportunity to meet all of their family and friends. My Facebook friend circle has expanded once more, and I’m sure it won’t be the last time I see these people. The time I see Gunjan and Farhan better be when they visit us, in Canada! 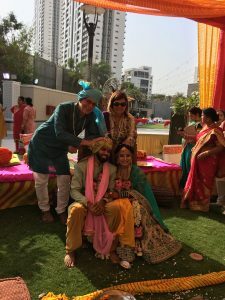 That’s my big fat Indian wedding story.